I'm using Kwin/KDE. I've only just moved to Arch, so I've not tried the 2.8.0 version before. (I never had these problems in Kubuntu, although I'm not sure what version I ran.) I get the same glitches using the Java Web Start version. I'm certainly happy to test removal of JGoogleAnalytics_0.3.jar at least, once I get Jalview working. I guess a potential problem is that removal of some components might break obscure parts of Jalview that I don't use, for others. Hmm, it seems to work fine on my system (OpenJDK 1.7.0_55 on AwesomeWM). What window manager are you using? Did this problem occur with the 2.8.0 version? 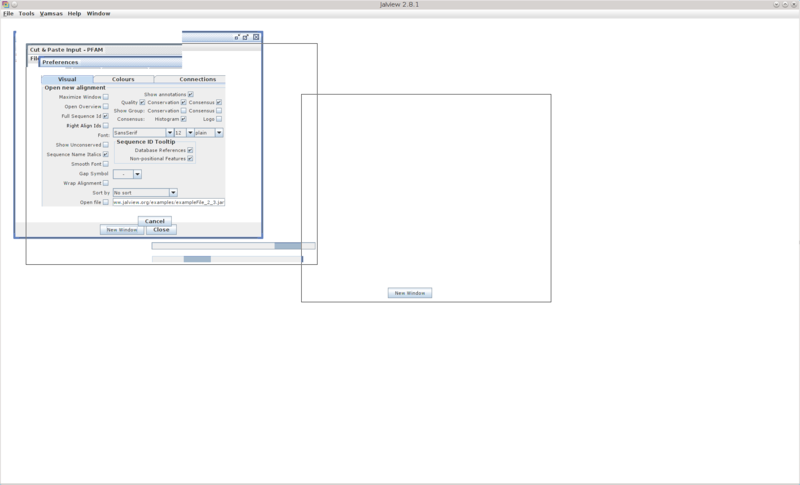 Does the problem also occur when you launch the JalView Desktop from their homepage via Java Web Start (the purple button on http://www.jalview.org/)? It builds fine, but after launching there are many graphic glitches, making it unusable. (See screenshot https://i.imgur.com/YhN0tsm.png ) I get this for openJDK (1.7.0_55) and Oracle Java (Java version: 1.7.0_60).